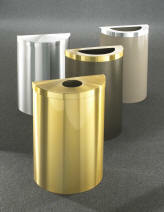 These durable indoor/outdoor economy Glaro Waste Receptacles have been designed with both appearance and cost in mind. Waste receptacle covers have an extra wide lip to conceal the poly bag liner, which is fitted over the body for a near professional appearance. This style reduces both the shipping weight and the cost. Optional plastic inner liner cans are also available on most models. 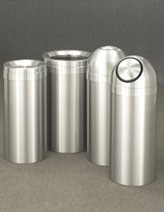 This Value collection of all metal, fire-safe waste receptacles is finely crafted in the USA by Glaro Inc. and can be shipped in 1 to 3 days. Glaro offers all satin aluminum plus 29 powder coat finishes baked on a galvanized steel body. Rust and tarnish-proof gloss brass and gloss chrome needs less cleaning and never needs polishing. You specify the finish of the hand spun aluminum cover. Select from satin aluminum (SA), tarnish-proof satin brass (BE), or a matching powder coated finish (MF). This choice allows you to create a customized look. These finishes coordinate beautifully with all other Glaro products. Seven designs are available: a simple and inexpensive open funnel top, an attractive and stylish self closing tip-action funnel top, a traditional dome design with open top, a traditional dome design with a spring operated self closing flap and three space saving 18 inch Half Round models. Self closing models offer an added degree of fire safety, help keep out rain/snow, and conceal odors. These custom fitted durable bags are the perfect solution for quick and easy replacement. They provide a snug fit over the top of the body. Bags are concealed when the cover is on. Value-priced Glaro trash cans and waste receptacles are specially designed to bring quality workmanship to economy waste receptacles with indoor and outdoor options. 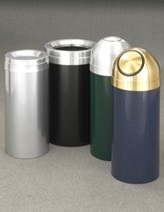 Value waste receptacles are a flexible line with versatile sizing, styling and finishing options. These economically designed all metal receptacles made from aluminum and steel are perfect for both outdoor and indoor environments. Please see our downloadable brochure for specifications, options and all product details. Most items ship in 1 to 3 days. Back to the category page on Waste Receptacles Metal Trash Receptacles.